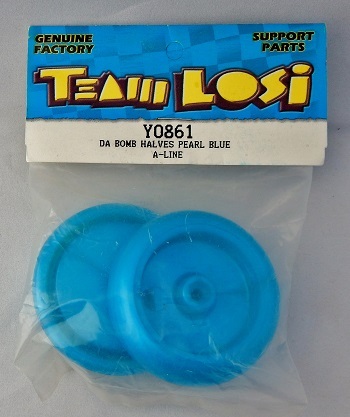 One set of replacement yo-yo halves for Team Losi's very popular Da Bomb, A-line model from 1999. The Da Bomb, A-line was similar to the Da Bomb, but the A-line series was slightly heavier and used a more durable, pearlescent plastic body. Team Losi, based out of Chino, California, made a variety of "support parts" for their yo-yo product line including ABEC 3 ball bearing axle sleeves, wooden axle sleeves, axle rods, rebuild kits, disk sets (side caps), power (weight) rings, and body halves. Original retail price: $4 US.